I keep telling myself 'patience is a virtue, patience is a virtue'. I know:). Everytime I get a gmail notification on this thread I take a deep breath. *EDIT* I just reset my download for Generation X, and it has not yet been updated to 1.2 as of 1557 Hrs PST. I just reset my download for Generation X, and it has not yet been updated to 1.2 as of 1557 Hrs PST. It'll probably be available after I go to bed tonight. :long: If it is, I'll dl it in the morning; I'll be able to play with 4.5 after work tomorrow. Still showing as version 1.1 though. Where do you see the version number on the page? At http://www.daz3d.com/shop/genesis-generation-x it says " This product is currently incompatible with DAZ Studio 4.5"
but on the update software page http://www.daz3d.com/shop/genesis-generation-x-upgrade-from-gen4 it do not say "incompatible with DAZ Studio 4.5". I assume it is not ready for 4.5 yet. [Where do you see the version number on the page? Not on the shop page, in the name of the downloadable file in My Downloadable Products. Release the Update to Gen X, so I can purchase it..Cash Waiting.!!!!!.. Downloaded it AND IT WORKS!!!!!!!!!!!!!!!!!!!!!!!!!!! Arrrrgh! I can't download this 'til I get home! It's good it's out now though. I know what I'm doing tonight. Does the Gen3 addon also need to be reset, or just the base program? I reset those, and they do have new files that have Studio 4.5 in their names, as well. I've downloaded them all, now I just need to find the time to install them. I have to say thank you very much D3D for the update!! Okay, I reset my downloads and got 3 files for the Gen 3 shapes (M3+V3, A3+H3, and S3, D3+F3) The Gem4 update is only the one file for M4+V4. This is because all the secondary figures were morphs of M4 and V4 right? I'm not missing any additional files. The Gen 3 addons are in 3 files because they can be bought separately, that's all. The main program is just one installer. Good-oh, I was pretty sure it was something like that. Looks like it's no news, but here's the official announcement that GenX and the Gen3 add-ons are now available for DAZ studio 4.5. Former customers can get the updates by resetting the download for their purchase at the DAZ store. I'm sorry that releasing the update took a bit more time than expected. Besides working in DS 4.5, there are also some improvements and bug fixes in the new version. 1. The morphs are now transferred with an improved scheme to get smoother results in particular for the face (s. image). 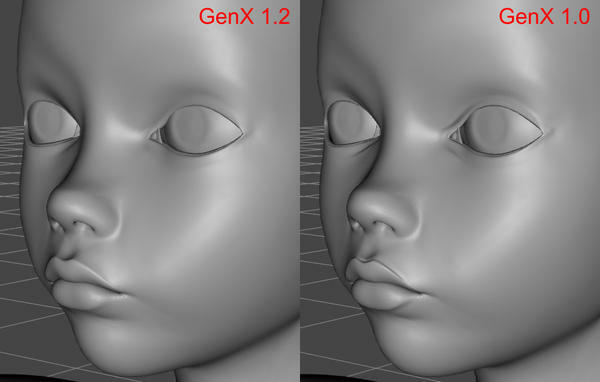 The improved presets are selected initially by default when loading a figure in GenX. The former presets are still included, they are marked by [1.0] just in case you prefer the old scheme. 2. It happened sometimes that a few single points were transferred wrong, in some cases this ruined the transferred morph, in other cases it was hardly visible. This bug has been fixed, there should be no more errors in the transferred morphs. 3. It is now possible to get morph values (i.e. dial settings) directly from a figure in the DS scene. If you have a character saved in a DS scene or as a DS script, or if you have otherwise problems to load the morph values into GenX, you can now load or setup the figure in the scene and get these values from there. 4. GenX now supports compressed DSF files and has some other adjustments to be compliant with the DS 4.5 file format. Because of 1. and 2., I recommend to transfer your morphs again to get better results. Any update on the DSF Toolbox? The update for the DSF toolbox is on its way as well, hopefully it will be released today or tomorrow.